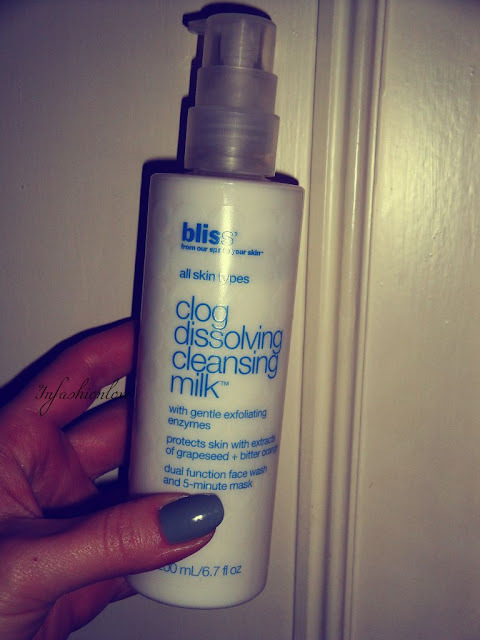 INFASHIONLOVE.COM: Bliss Clog Dissolving Cleansing Milk! Hope you all have a lovely Sunday! I had a really relaxing not-doing-much day, just caught up with a friend and we went to watch the I Give It a Year at the cinema... Was rather enjoyable to be reminded that sometimes doesn't matter how hard you try to make a relationship work when you are with the wrong person it just feels enlightening when you finally leave them, and meet the right person that is a joy and true pleasure to be with instead! I really like it, and the reason is that it's meant to suit all skin types so it's not even specifically designed for combo/oily skin type, which I have, yet I love it on my skin! When I use it as a facial it seems to reduce the appearance of enlarged pores significantly, which makes sense hence it's de-clogging them... At the same time it's keeping the skin nicely hydrated and balanced, which means for us, people with combo/oily skin types it's a bit of a miracle because usually if you get such a cleansing effect the skincare products tend to strip the skin too much making it then over produce oil... Catch 22... Not with this baby! And when I don't have time for a facial I simply use it as a cleanser in place of my regular facial cleanser, and it just leaves my skin feeling fresh! I am a huge fan of Bliss products in general, and this sounds awesome, so I really think I need to try it!